Convert .NET 7.9.6108.2 » KaZachya.net: Информационно-развлекательный портал. Convert .NET - конвертер языков программирования, преобразует C # в VB.NET и наоборот. Так может использоваться как переводчик, имеется поддержка 107 языков. Для работы программы необходимо наличие NET Framework 4.6 для Windows 10, .NET Framework 4.5 для Windows 8 (8.1), 7, XP и ниже. 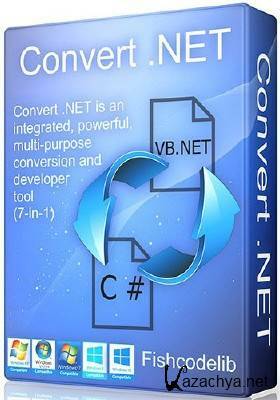 Convert .NET is an integrated, powerful, multi-purpose conversion and developer tool (7-in-1). Convert .NET is a small and nifty application that translates text between multiple languages and programming code (C# to VB.Net), decodes and decrypts information, and tests regular expressions, among others. The tool does not require installation, which makes it portable. It means that you can simply drop the executable file in a custom location on the hard disk and click it to run. Alternatively, you can save Convert .NET to a USB flash disk or similar storage unit, in order to run it on any machine effortlessly. What's worth mentioning is that Windows Registry does not receive new entries, and extra files are not created on the hard disk without the user's consent, leaving it clean after removal. The main application window is divided into two panels dedicated to writing text and viewing its translated form, respectively. The Google Translate service is used for language translation, so an active Internet connection is a must. When testing regular expressions, it is possible to replace words, ignore the case and enable multi-line mode. You can undo your actions, clear all data, access online documentation (e.g. character escapes and classes on Microsoft's website), as well as point out a directory to process multiple files at once in a separate batch mode panel. As far as program options are concerned, you can switch to a different UI language, skip comments when converting C# code to VB.Net, as well as opt out of languages used via the Google Translate engine. Convert .NET quickly performs a conversion or translation job, while using pretty low CPU and RAM. It does not burden the overall performance of the computer or interrupt normal user activity. We have not come across any issues throughout our evaluation, as the tool did not hang, crash or pop up error notifications. Thanks to its intuitive layout, Convert .NET should satisfy all types of users.